Last Saturday, I had the privilege of attending the annual Forrest Luncheon, sponsored by the United Daughters of the Confederacy ladies of General Forrest Chapter #1194. The event was held at the Chickasaw Country Club in Memphis. Entertainment was provided by two very talented members of the 52nd Regiment String Band. 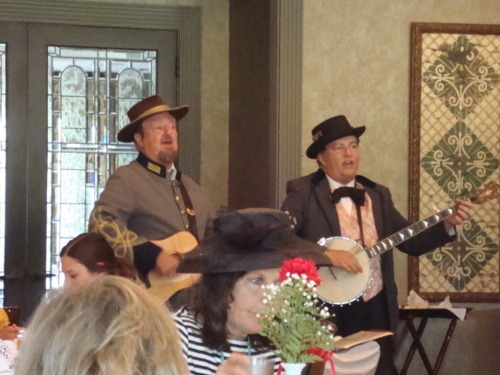 The performers played period favorites, including “Lorena,” When Johnny Comes Marching Home,” and of course, “Dixie,” to which all the attendees stood in honor while they sang along. The guest speaker was Mr. Jimmy Ogle, a Memphis historian who was very informative. His talk centered around sites relevant to the Civil War in relation to Memphis. 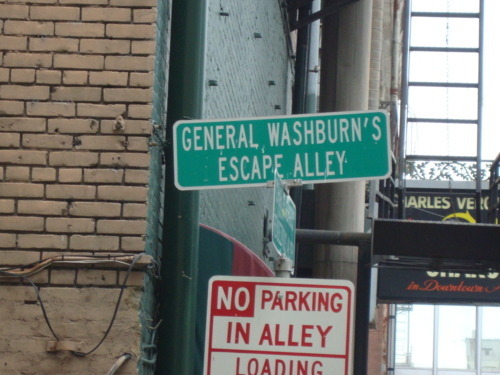 It was interesting to learn about old places in Memphis that played a part in the War Between the States, and still exist today. The meal was fabulous, as was the company, and a silent auction followed. Two authors (myself included) were on hand to sign their novels. Many thanks to the ladies of UDC General Forrest Chapter #1194 for providing a wonderful afternoon! Today marks a significant anniversary in the history of the War Between the States. On July 21, 1861, the first major battle of the Civil War took place. It was a Sunday, and the elite from nearby Washington D.C. came to watch the fight, bringing with them picnic baskets to nearby Manassas Junction (Bull Run Creek) in Virginia. Both Confederate and Union armies were unseasoned and ill-prepared for a battle of such proportion, but once Confederate troops received reinforcements, they overpowered the Yankees, sending them running back to Washington (the battle later became known as “The Great Skedaddle.) Wealthy congressmen, senators, and their families had to leave their picnics in haste when their spectator sport became a very terrifying experience. Their carriages became clogged on the road back to Washington, and some of the Northern legislators were captured. During the course of the battle, General Bernard Bee, who was leading the 4th Alabama, noticed Thomas Jackson sitting still on his steed, Little Sorrel, regardless of the shells exploding around him. “See he stands like a stone wall!” General Bee told his troops. “Rally behind the Virginians!” Not long afterward, General Bee was mortally wounded. Although the Confederates were victorious, a total of 460 Union and 387 Confederate soldiers were killed. The battle was a sobering experience for both sides, who realized that the war would be much longer and bloodier than originally anticipated. Anyone who has ever attended a reenactment knows that famous Civil War celebrities are usually in attendance. These include generals that participated in the particular battle that is being recreated, such as General Robert E. Lee, General Stonewall Jackson, General U.S. Grant, and General J.E.B. Stuart, to name a few. Sometimes characters who weren’t present at that particular battle show up anyway, and sometimes, the characters’ wives attend, too. Presidents also show up, namely President Jefferson Davis and President Abraham Lincoln. Reenactors travel all over the country to different events, studying their characters in depth to effectively and accurately represent them. Besides reenactments, they attend conventions, book signings, school assemblies, and any other opportunities that present themselves, giving the actors a chance to share their passion for the celebrity they portray. Needless to say, there are many who represent the same character. Just like there are hundreds of Elvis’s thriving in Las Vegas, so too, are dozens of Robert E. Lee’s, General Sherman’s, and Stonewall Jackson’s lurking around. Some even hold annual conventions that give them the opportunity to hone their craft, and share insights as to specific qualities and quirks of their characters. This year, 45 Lincolns descended on Greeneville, Tennessee for their national convention. Their meeting place was near the home of Andrew Johnson, who was Lincoln’s running mate in 1864, and who became president the following year, when Lincoln was assassinated. General John Hunt Morgan, C.S.A., was killed by Union soldiers in the town as well. The impressionists ranged in age, the youngest being 36 years old, and came from all over the country. Several Mary Todd Lincoln’s also attended. The reenactors are members of the Association of Lincoln Presenters, which lists 124 Abraham’s, 34 Mary Todd’s, and 18 teams of Abraham and Mary Todd combined. These specific impressionists exist in 34 states. The Mechanized Cavalry Rides Again! Last Sunday, a group of dedicated Confederate descendants rode to the rescue of a Korean War vet. Perry Thrasher recently received media attention when he was forced to take down the Southern Cross in his room at the Memphis VA hospital. This happened after a nurse complained that the flag was “racist.” Mr. Thrasher has an ancestor who fought in the War Between the States. Enter the Mechanized Cavalry, comprised of motorcycle enthusiasts who are also Sons of Confederate Veterans members. To honor Mr. Thrasher, the group bestowed on him a lifetime membership to the Mechanized Cavalry, as well as a lifetime membership to the SCV. Apparently, because of all the negative press the VA hospital received, Mr. Thrasher has been allowed to have a quilt on his bed that looks like a Confederate battle flag. 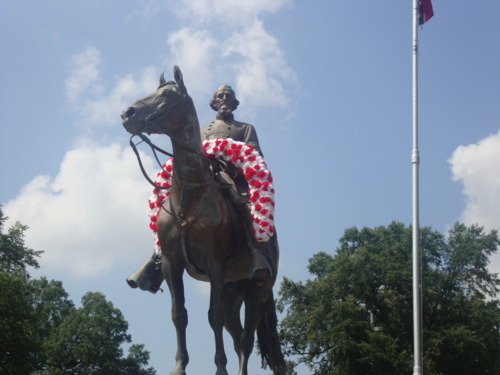 After honoring him, the Mechanized Cavalry traveled to Forrest Park, where they participated in the annual birthday celebration/ceremony for General Nathan Bedford Forrest, CSA. Wednesday marks the anniversary of one of the Civil War’s most influential and controversial commanders, Nathan Bedford Forrest. Born on July 13, 1821, Forrest rose to fame after enlisting as a private in the War Between the States. Because of his outstanding, strategical military mind, he advanced to general during the course of the war. At the onset of the Civil War, Forrest was a wealthy planter, slave trader, and real estate investor. Although he had no formal education, he worked hard (his father died when he was 17, leaving him responsible for his family) and put his younger brothers through college. Becoming a Memphis millionaire, he paid for horses and equipment for a regiment of Tennessee volunteers. From there, he proved to be a military genius in several battles. He was quoted as saying he was the first with the most, and that he came out a horse ahead (he had 29 horses shot out from under him, but killed 28 men). Author Shelby Foote stated that there were only two geniuses in the Civil War: Abraham Lincoln, and Nathan Bedford Forrest. At the massacre of Ft. Pillow, Forrest was accused of intentionally killing surrendered Union soldiers because they were black. He was later found innocent of the charges. After the war, it was rumored that he helped establish the KKK, but this has never been proven, and he denied it adamantly. In fact, a court hearing was held, led by Union General Sherman, to prove his guilt, but that never happened. General Forrest was only 56 years old when he died on October 29, 1877. Originally buried in Elmwood Cemetery, his body was disinterred to Forrest Park in Memphis in 1904. Every year, a ceremony is held to honor this special man and significant Confederate leader. This year, members from the 15th and 17th Mississippi, the 51st Tennessee, Nathan Bedford Forrest SCV Camp from Memphis (who hosted the event), the Mechanized Cavalry, and Tennessee’s Wigfall Greys attended, some dressed as reenactors. Lee Millar gave an honorary speech, and entertained the crowd of around 300 with fellow members of the 52nd Regimental Band. Many UDC ladies were there as well, including the Varina Howell Davis Chapter. Wreaths were placed at the monument, and after the ceremony, everyone enjoyed watermelon in the nearly one hundred degree heat. One of the more obscure battles of the Civil War took place in Carthage, Missouri on July 5, 1861. It was one of the last skirmishes of a running battle between Union Colonel Franz Sigel’s troops and combined soldiers accumulated by Governor Claiborne Jackson, consisting of 6,000 militia and unarmed troops, who were headed to Arkansas to join with Confederate forces. Sigel’s outnumbered 1,100 troops were in pursuit of the traveling Missourians. They lost the battle, but were able to escape. The remaining site consists of seven acres, located next to Carter Park on East Chestnut Street. A museum of the battle houses a diorama and mural of the battle. Admission to the museum is free. It is located at 205 Grant Street, and is open Tuesday-Saturday from 8:30 a.m. to 5:00 p.m., and Sunday from 1-5. This weekend marks the 148th anniversary of the Battle of Gettysburg. Every year, a reenactment takes place in the town, and this weekend is no exception. Thousands of reenactors from all over the country participate with authentic clothing and weaponry. They camp out over the weekend in Civil War tents, and even dance in a period ball, complete with ladies dressed in beautiful gowns. Battles are staged, and living history demonstrations are performed. There are a number of vendors selling their wares during the three-day event, and period musicians perform as well. The event is similar to a Reinassance Festival, except that it revolves around the Civil War instead. This year, 72,000 reenactors signed up to participate. There are also around 100 cannons and 400 horses (cavalry) involved. The presentation is spectacular, and gives spectators a glimpse at what fighting during a Civil War battle was really like. The Battle of Gettysburg took place July 1-3, 1863, when Union forces, coming from the south, collided with Southern troops travelling from the north in search of shoes (a shoe factory was in town). After the first day of battle, General Robert E. Lee’s Confederates were victorious, but by the end of the third day, and Pickett’s infamous Charge, the battle was considered to be a draw. It wasn’t until several days later that Union General Meade’s Army of the Potomac learned they had won the fight. The battle was a pivotal one in that, from that time until April 1865, the Union army started winning battles, and ultimately, won the war.